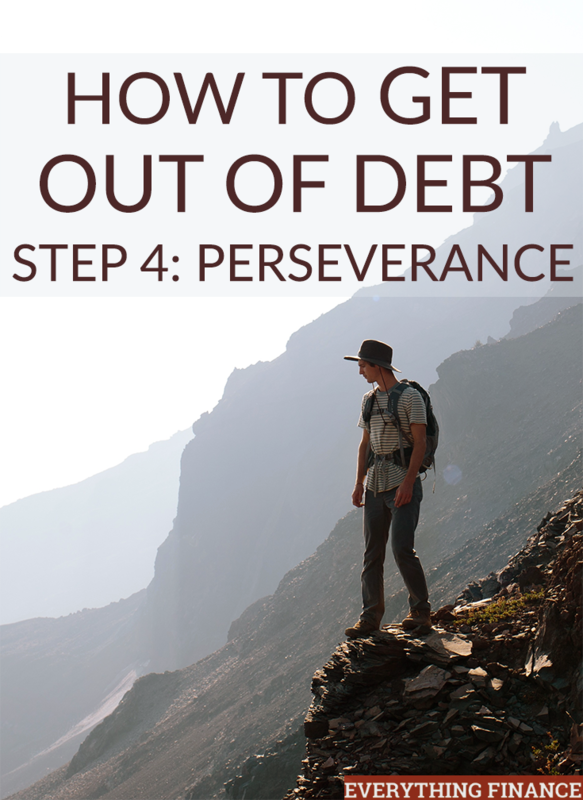 This is the fourth post in a four-part series on How to Get Out of Debt. Read Part I, Part II, and Part III first. By now, you should have accepted your debt, created a plan and set a debt payoff date, and reduced your expenses and increased your income to pay off your debt faster. Oftentimes, paying off debt is a long and slow journey filled with lots of sacrifices. There will be many moments when you’ll get fed up of having to make sacrifices and forgo spending money in order to get rid of your debt, and you may even question your decision. Is it really worth it? What about living for today? How long can you really keep this up? To maintain your commitment and perseverance to paying off debt, you have to keep a few things in mind. Realize that there will be setbacks in your journey. Emergencies will arise that will derail your efforts and have you questioning whether being debt-free will even be possible. Don’t give up. Throughout our 45-month journey to paying off $45,000 of debt, my husband and I ran into setback after setback, including a work injury that left him without pay for almost two months, a car accident that cost us $1,000 out of pocket, and a health injury that cost us another $1,000 in medical bills. It felt like we were getting derailed time and time again, and we had to put our debt-free dreams on hold. But no matter how many times we felt we got kicked down, we always got back up. Life will always have setbacks, but don’t let these become permanent roadblocks. If you stick with it, you’ll eventually pay off your debt. The one good thing about your debt journey is that it’s not infinite. No matter what, you will pay it off if you stick with it. There will be a day that your debt balance equals $0. Remember that paying off debt is not forever. If you need more motivation to pay off debt, read this post on how to increase debt payoff momentum. Paying off debt requires making a lot of sacrifices. You can’t do all the fun things you want to do, and you can’t spend money on all the fancy things you want to buy. But that doesn’t mean you have to hide away and eat ramen noodles for your entire debt payoff journey. When you hit milestones, reward yourself. Perhaps let yourself spend 10% of your total monthly debt contribution on something for yourself instead, or put it in a savings account to contribute toward that fabulous vacation you’ll take once your debt-free. The benefit of giving yourself a reward is that it keeps you motivated and it will also allow you to pay for your vacation in cash! Once you’re done paying off your debt, you won’t ever be going back to a financed lifestyle! Paying off debt is a hard and tireless journey. But making the commitment to becoming debt free ensures financial security for your future. With this four-part series on how to pay off your debt, you have the tools you need to start your journey. Good luck! Have you hit roadblocks on your way to becoming debt free? Have you had moments where you wanted to give up? How do you stay motivated?